Everything is awesome for Lego right now - even though it didn't win an Oscar. From a box office blow-out movie to winning the social media Oscars, everything is pretty awesome for Lego right now. And it’s reflected in the numbers: sales up, profits up and a eye-wateringly enviable operating profit margin of 34% last year. The Danish toymaker’s revenues rose 13% to 28.6bn DKK (£2.8bn), while profits climbed 15% to 9.5bn DKK. It sold a staggering 62 billion ‘elements’ last year – bricks, sets and figures – and was played with by 85 million children around the world. The Lego Movie was a huge commercial and critical success last year, raking in an estimated $469m (£303m) worldwide. Six months ago it said it stole Mattel’s Barbie princess crown to become the world’s biggest toymaker. And to top it all off it was named the world’s most powerful brand last week by consultancy Brand Finance. Phew. That rather makes up for The Lego Movie not even being nominated for best animated film at the Oscars, and missing out on best song for Everything is Awesome. 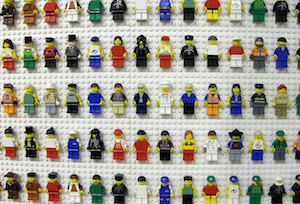 But instead of accepting defeat, the company handed out Lego Oscars to the glittering attendees and Twitter went wild. The brand got more than 47,000 mentions on Twitter, according to Amobee Brand Intelligence, and millions of dollars worth of free, celebrity-approved advertising. It’s a stunning turnaround from a company that almost went bust ten years ago – and proof that sticking to what you’re good at, combined with a healthy dose of nostalgia and internet buzz, is a winning formula.